The applied transient hot wire technique which is fast and reliable for liquid phase measurements. 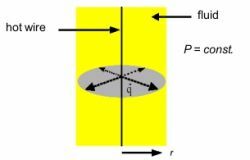 The thermodynamic basis for the transient hot wire method is the ideal model of an infinitely long, vertical line source of heat emitting a constant heat flux q to the fluid and being surrounded by a temperature field (see following figure). In our laboratory a commercial sensor system was combined with an individually constructed high pressure cell including high pressure pump, pressure sensor and electrical or liquid thermostat. For the thermal conductivity measurements of solid (e.g. powder or foam), liquid or paste samples the TCi Thermal Conductivity Analyzer (C-Therm, Canada) with a patented sensor technology which expands the capabilities for rapid, non-destructive thermal conductivity and effusivity testing is availabe. The system has broad testing capabilities (0.0 to 100 W/mK) across a wide range of temperatures (–50˚ to 200˚C). Compared to the widely used transient wire method this method can also be used for the determination of thermal conductivity data of samples with high electrical conductivity (e.g. aqueous electrolyte solutions). The TCi employs the modified transient plane source (MTPS) technique. It uses a one-sided, interfacial, heat reflectance sensor that applies a momentary, constant heat source to the sample. A known current is applied to the sensor’s heating element providing a small amount of heat. The heat provided results in a rise in temperature at the interface between the sensor and the sample - typically less than 2 ºC. This temperature rise at the interface induces a change in the voltage drop of the sensor element. The rate of increase in the sensor voltage is used to determine the thermal conductivity of the sample material.